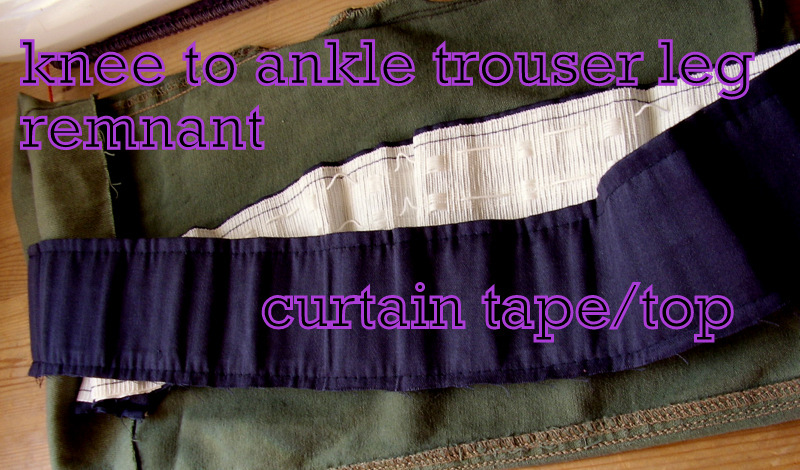 Choose how you will make the strap – I have leftover curtain tops with tape to use up, but you could cut lengths from the upper leg, use rufflette tape or an old belt. 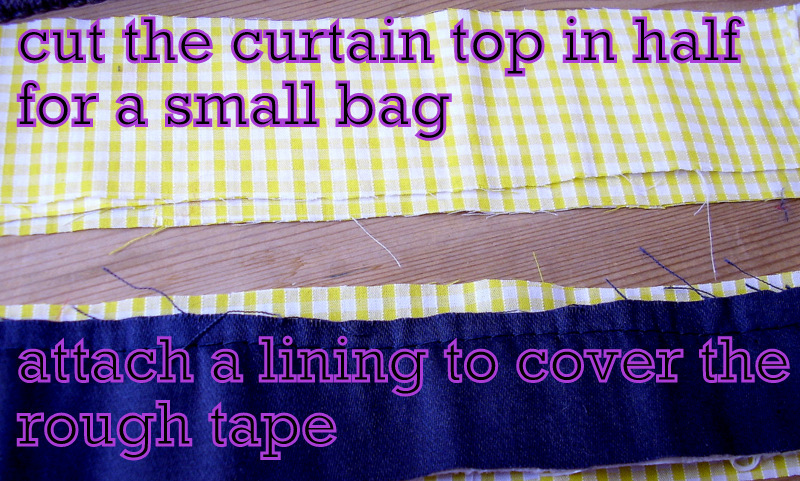 Curtain tape is wide, and this is a narrow bag, so I have cut the tape in half so one curtain top will make straps for two bags. Curtain tape is also scratchy, so I’m lining it with some leftovers from random plank quilting. 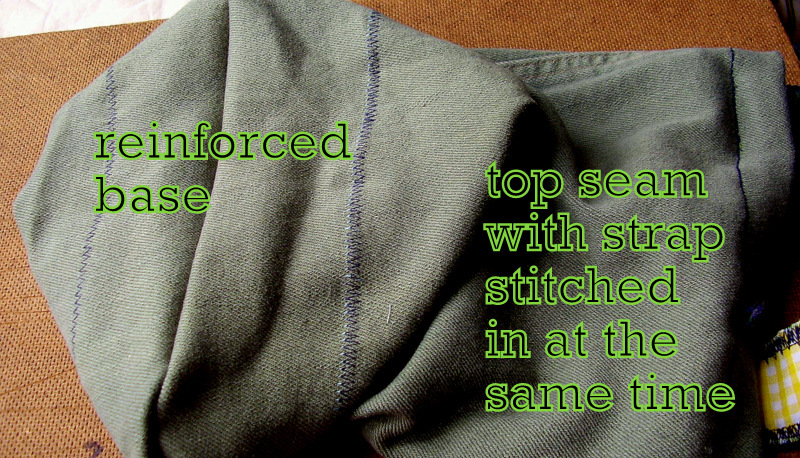 First attach the lining with pins, then a running/lock stitch seam, so it will be easy to edge. Turn the leg inside out – according to which side you like best! – and fold the base edge down to make the reinforced base, this is probably 3″/10cm, but if it is a very wide leg, may be 5″/ 15cm. On a narrow leg the base is the knee, on a wide leg the base is the ankle – cut away any torn bits, that grunge look typically walks through the hems. How can you tell the right amount? 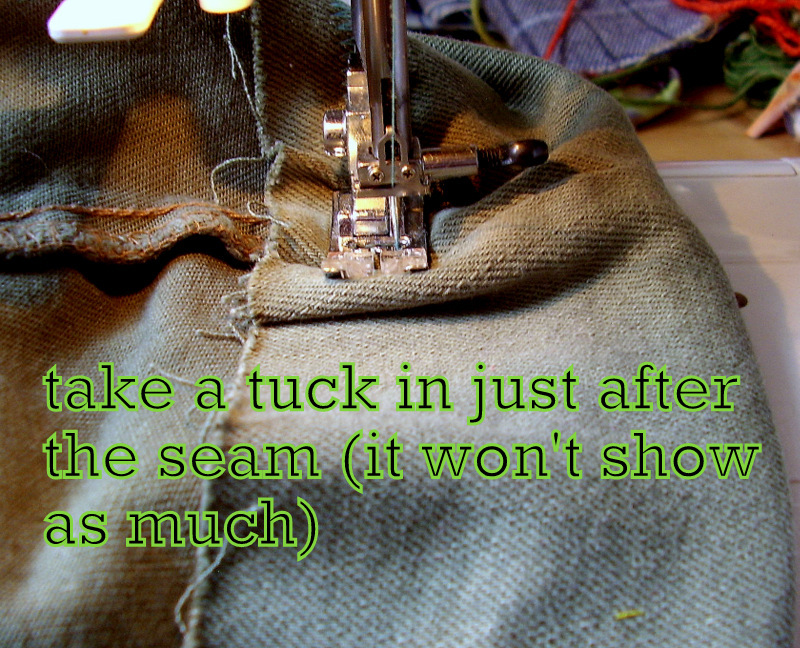 If you need to take tucks, then do it just after a seam, it will show less and your sewing machine foot will still be high. 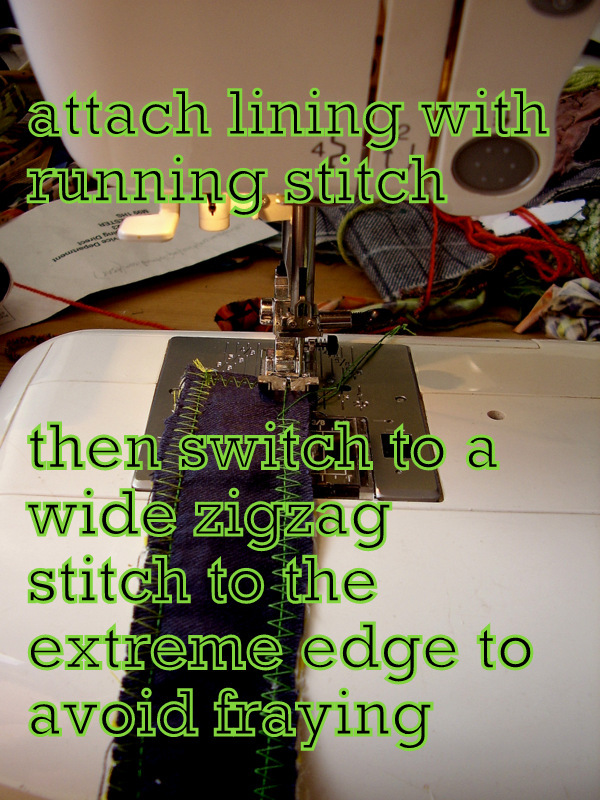 I go round twice, to make sure the stitching is as strong as the cloth, and if the edge looks likely to fray, then make an extra zigzag row over the raw edge. Now put the two folded edges together and stitch with triple stitch or 3 times running stitch, again, this is for strength. 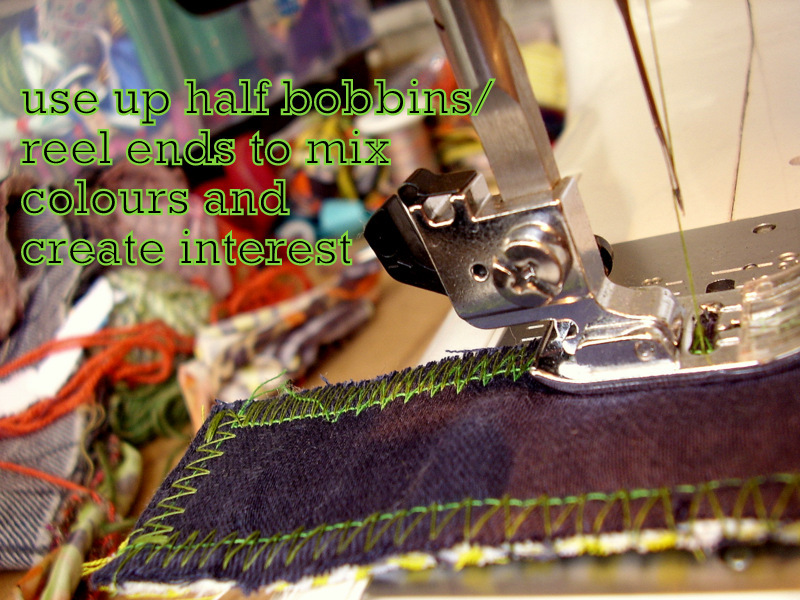 Turn the leg inside out and fold the top over if it needs it – some ankles will look fine at this point, so don’t bother with those. Finishing touches: sew a large button on, remembering to wrap the thread round the ‘stem’ holding the button – saves a ton of wear and should be done on every button that gets worked a lot. I sewed a loop of pretty cord on instead of making a buttonhole (confessions, my buttonholes are dogs dinners, to my shame! 😉 ) but a piece of shoe lace or string is fine. 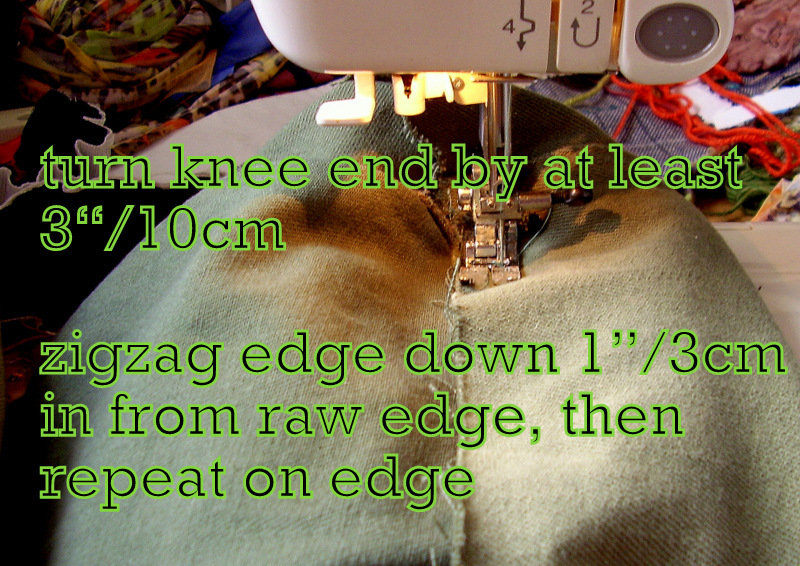 for a messenger bag, cut one side above the knee, and the other another 4 – 6 “/12 -17cm above. 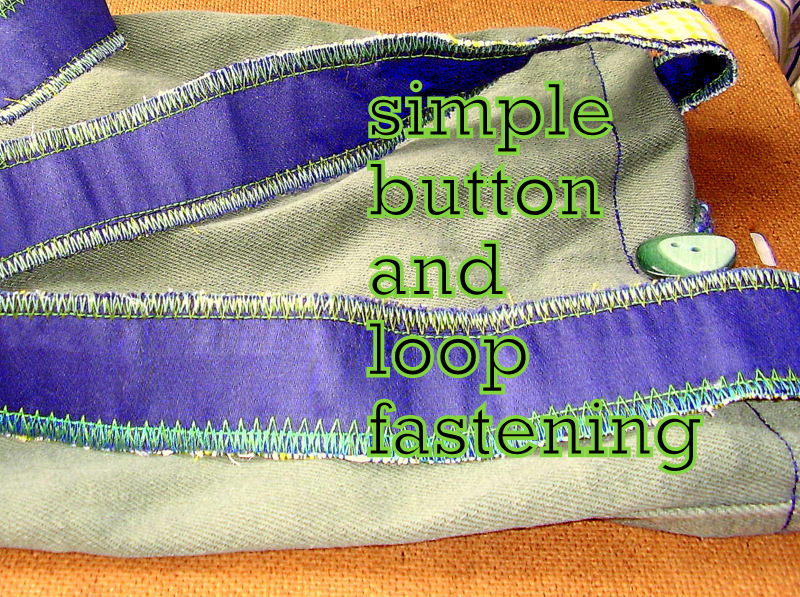 Hem it and sew the button where the edge falls on the bag, and the loop on the edge of the flap. 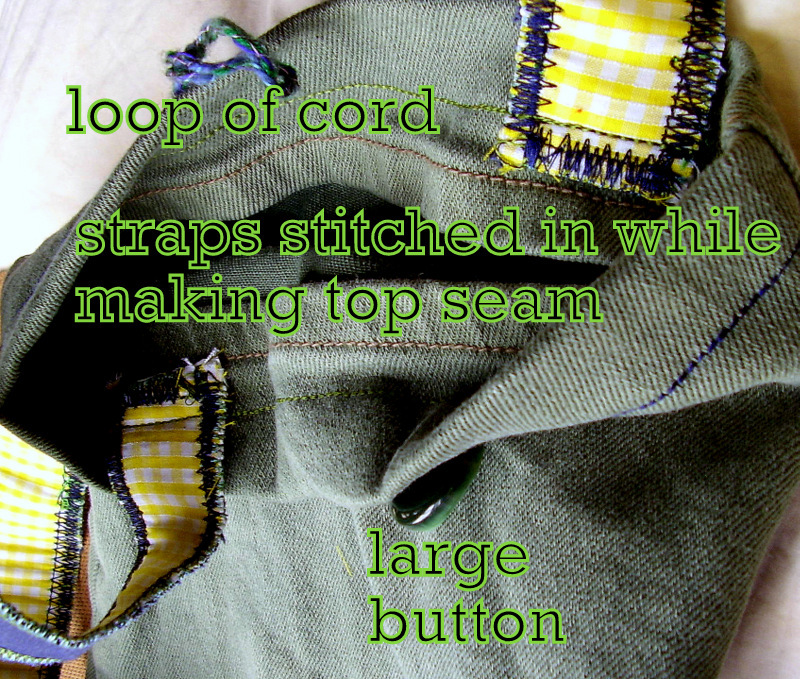 for a sports kit bag, cut two trouser legs open and stitch as a blunt triangle, with the straps attached at neck and base of bag, to go over the shoulder.